As kids head back to school in September, their schedules get more hectic, causing their time at home to become more precious. Whether it’s on school nights or weekends, cooking meals together is an activity that captivates your kids’ attention, benefits your family’s health and wellness, and gives you back the quality family time you’ve been missing. Studies have shown that only about 30% of American families have dinner together every night. When eating at home, families tend to eat healthier and consume fewer calories. According to The National Center on Addiction and Substance Abuse (CASAColumbia) at Columbia University, children who have frequent family meals perform better in school, maintain a close relationship with their parents and siblings, resist peer pressure, and are less likely to develop eating disorders. 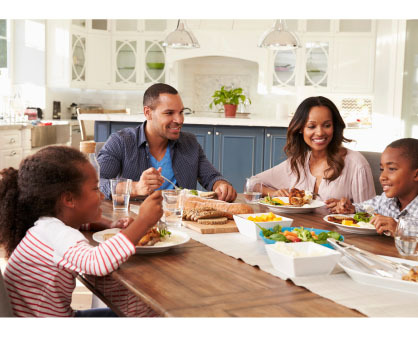 September is National Family Meals Month, which is the perfect time to demonstrate the importance of frequent family meals. This issue of Inspired details several meal ideas that will bring your busy family back to the kitchen and make mealtime more special. Children thrive in environments that allow them to showcase their freedom, creativity and individuality. Present your kids with three to five meal themes to choose from. Including them in the cooking process allows them to cultivate their independence while strengthening family bonds. Challenge your kids by occasionally designating them to come up with a fun themed dessert. With the fall season, many flavor options are available such as apple, caramel and pumpkin. Baking treats like ghost cake pops, mini caramel apple pies or candy corn Rice Krispies® will allow their creativity to soar. habits and a better understanding of where their food comes from. Kids love excitement, so make mealtime preparation fun. Involve the young ones in measuring out vegetables or spices, and teach the older kids the best techniques to crack an egg! The kids will love their new culinary responsibilities and gleam with pride as they see their tasty creations come to life.